Please Note: The following information describes the parade route for 2012. For 2013 there may be some minor changes pertaining to the dispersal of the parade. These changes will be announced on this website once finalized. Several years ago the route of the Parade returned to several of its' original traditions. As has been the case for the last several years, we continue to enjoy a parade that is held completely outside. The Parade will move off from Gore Park, proceed west on Lakeshore Blvd. through the Princes' Gates, along Princes' Blvd, in front of The Direct Energy Centre. The Reviewing Stand will be located just west of the Princes' Gates on the north side of Princes' Boulevard directly in front of the Direct Energy Building. The Parade will continue west along Princes' Blvd and disperse in the parking lot located south-east of BMO Field stadium. We expect the Parade route to be very crowded with spectators. The experience for those participating in the Parade and those watching it will be spectacular! Please arrive early to ensure that you have a clear view of the spectacle. While the CNE will be providing some stadium type seating on the south side of Princes' Blvd., the number of seats will be very limited. 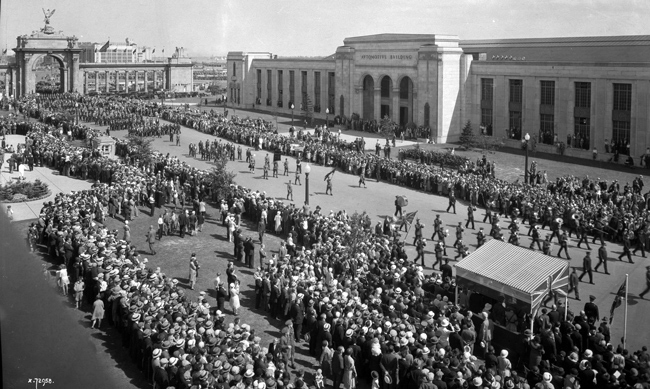 Here's a photo from the 1931 Warriors' Day Parade showing the Reviewing Stand on the north side of Princes' Blvd. The Parade route is indicated on the map below. Click on the map for a pdf copy.